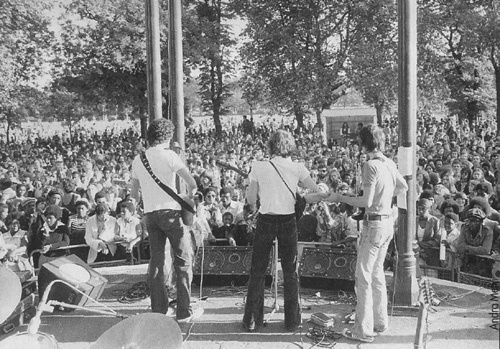 As promised in the comments on one of the last articles, I tried to find all pictures of one of Dire Straits’ first gigs – the one at the summer party for Charlie Gilett’s Honky Tonk Radio Show, on the Clapham Common bandstand, September 10, 1977. 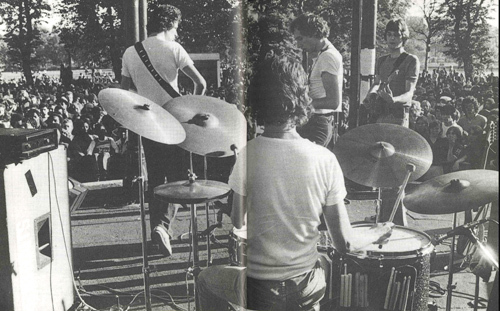 Unfortunately there are only 4 pictures it seems, not 5 or 6 as I hoped (the one on the sleeve of the Honky Tonk Demos compilation turned out to be the same as the one in Michael Oldfield’s book about Dire Straits). 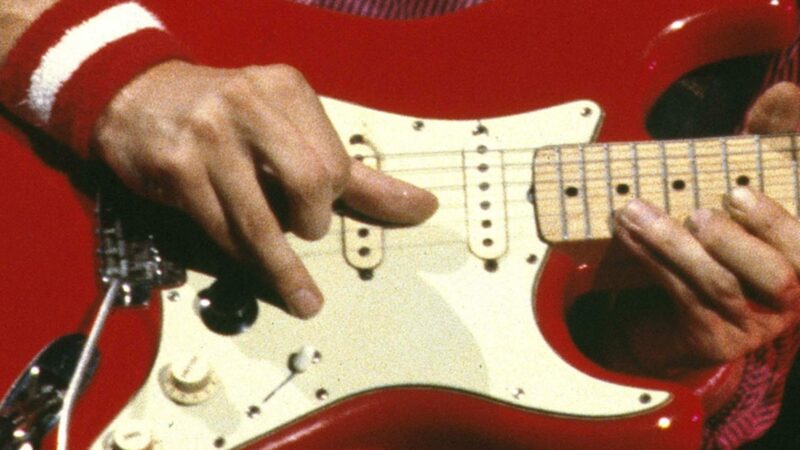 Knopfler is tuning his # 68354 Strat here (the ’61 with rosewood fingerboard), plugged into the brown Vibrolux. You cannot really see what the amp next to it is, but my guess is a blackface Fender Concert Amp, the same you can see in this article of this blog. I suspect it was borrowed from Mark’s Notting Hillbilly friend Brendan Croker. On the right side you can see the neck of another guitar: Mark’s ’59 Gibson Les Paul Special. The bass amp seems to be a …, well, a weird amp ;). The following picture is the one from the Michael Oldfield book. Meanwhile it turned out that it is cropped in the English version of the book, while the French version includes a full-size version of the same pic (Thank you for sending me the pic, Jean-Francois) . The difference is just some mere 15 % at the right side, but these 15 % just show an essential detail: the backside of the Strat. I can imagine that it is taken just some seconds before or after the one before, so I think he plays that Gibson on both pictures. Note that pedal: a colorsound. 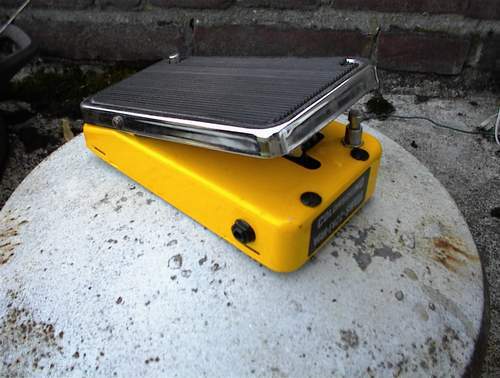 This can be a volume pedal, but more likely it is a wah or rather wah/volume (most of the colorsounds you find are this combination). They came in different colors, like yellow, blue, silver, purple, etc. It is a bit noisy but sounds really fine otherwise, it has its own character, like most good wahs have. I even remember reading somewhere that Mark used a wah on this or the very first gig they did on a lawn before their house in Deptford, London. Some other bands that played on this summer party gig were the Darts and Rico. 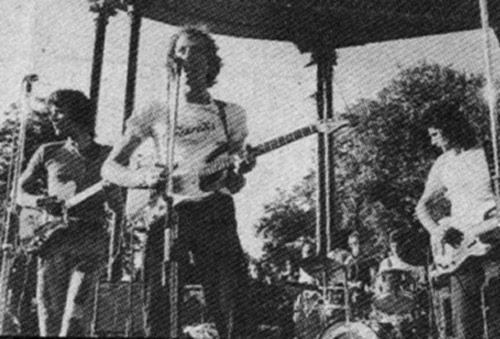 In the evening of the same day Dire Straits played in the Hope & Anchor pub in Islington. The photographer of all these pics is Andra Nelki. In the Oldfield book, Mark says that he was using a wha with the Cafe Racers to play a song (“fade away” or someting like that, not sure about the title) “just like the James Burton version”. He talks also about the LP and the amp put on a chair.It’s in the early chapter of the book (don’t have it at the moment, so can’t tell the page). The name was changed when they played the Albany, which was before this gig. I think he got the Strat after the Cafe Racers but of course still had the Les paul Special. 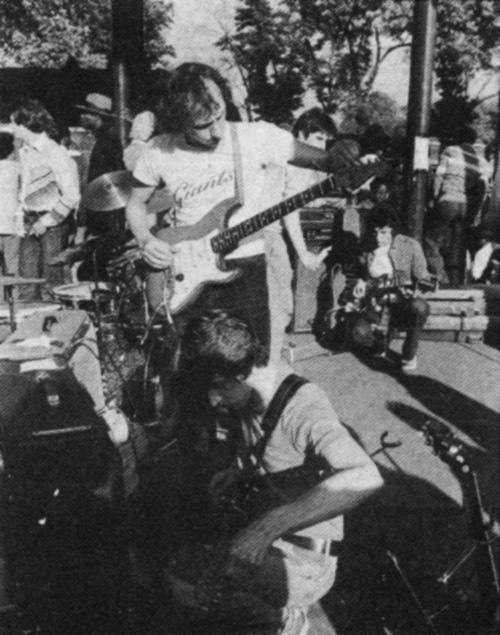 The amp he “used to put on a chair” with the cafe racers was a Selmer 2×12 combo I think, but it seems he did not have this one when they started with Dire Straits (maybe he traded it for the Strat?? ), and John had the Vibrolux. I alway wondered what gear MK used for the BBC sessions of july 78 (Live at the BBC record). Was it the Twin reverb ? 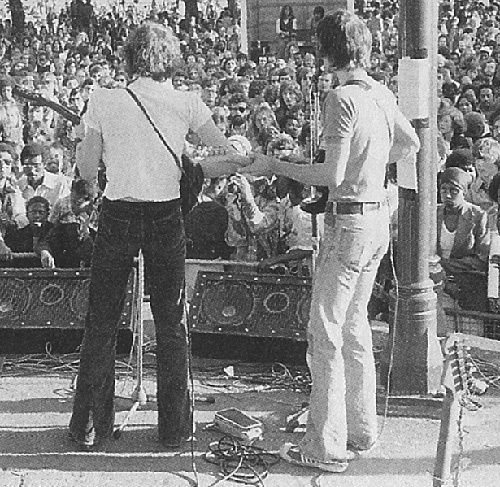 But that strat sounds very loud compared with other lives of those early days. I think he probably used some overdrive pedal, but don’t know which one. I don’t think Mark used overdrive at that time. Indeed, the guitar on live at the BBC sounds more satured as usual, but the bass sounds also that way, even drums are not very clean . Maybe the amp gain was a little more up, to have more volume. Live sounds are often less clean than studio ones. It has always interested me to know how get drive sounds : just with amp gain, pedals or so. When I listen Hendrix, it’s always difficult to say if it’s the marshall, or the fuzz which make this sound. Th marshall with guitar volume at 10 can be more drive than the fuzz with guitar volume at 5. On Gilmourish, it’s explained that all drive sounds of Gilmour from early 70’s are played with a fuzz, and the guitar volume roll down. I find it strange, because he could have satured the amp without using a fuzz, like Ingo did on the record with 2 mics. On my amp (a Peavey 60w transistor) I have 2 channels : normal and drive. But on the normal one, I don’t achive to get a warm tone, it’s just like an acoustic, you know “gling gling”. So, to have a warmer tone, more sustain, I have to use the drive channel, with less guitar volume, and then it’s like I had a tube amp (well not really, but you know what I mean). My english is so bad ! By “satured” I meant “saturated”, I guess you all had understand. The amp on Live at the BBC should in fact be a silverface Twin Reverb into Marshal cabinet. It think the distortion comes from the amp, no overdrive pedal. You need to crank up these Fender amps a bit to get this distortion, don’t think it comes from the desk, surely not, this would be a rather nasty distortion. Indeed, sound board overdrive always sounds awfull. What make overdriven tones so beautifull on guitar is the filtering hability of the speaker/cabinet. If you record the overdriven signal directly in the preamp of the amp (as Ingo showed it with in his article) it also sound usefull, may it be a tube amp or a transitor one. I built a super reverb recently with a nice overdrive capability. I guess that the amp was pretty loud in the BBC studio. One can also notice there are a lot of bass frequencies in the guitar sound. This would confirm that the Marshall cabinet was actually used. It sounds somewhat “Marshall” to me. Do you know what kind of speakers this cab had ? I guess it was a 4×12.